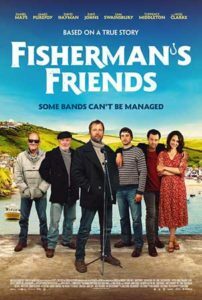 This film is a fictionalised documentation of the lives of a group of fishermen from Port Isaac, Cornwall who got famous after appearing on television after they were hired to perform the National Anthem. Although what actually happened I won’t spoil since this is actually covered in the film. The film looks, from the outside, to be a proper classic British film, which is what you could probably expect from this type of film. It’s a pretty quintessential type of story that you get from our neck of the woods. In the director’s seat is Chris Foggin, you may remember he has worked as an assistant or second unit director but has directed some short films including a Judy Dench short film “Friend Request Pending” although this is the first time I’ve seen one of his movies and while you may not have heard of his own filmography, you will have heard of most of the films he was a second or third unit director on, such as “World’s End”, “The Iron Lady” and “The Deep Blue Sea”. Now, I won’t bore you with the plot and say I’ve basically kind of explained it, but basically it is essentially about a music manager named Danny, played by Daniel Mays, who is travelling to Cornwall for part of a stag do. His boss, Troy, played by Noel Clarke insists that he signs the group up to perform a street show, not realising this is a joke he goes ahead and makes a tonne of promises only to then be told it’s a joke. Obviously he’s now met the men, realises how nice they are and doesn’t want to back out of the deal and so now he has to try to get them a contract. It is as gentile as it gets, do not go into this film expecting any sort of surprise whatsoever, if you know how quintessential British films go, you will see everything in this film coming a mile ahead. Does this make it bad, hell no! Fisherman’s Friends is not exactly an exciting film or even all that great in certain parts, but as a purely inoffensive film with not much bite to it, you can certainly do a hell of a lot worse and I will freely admit since I am a man with a soft spot for sea shanties, this one was really rather enjoyable. I will freely admit I have only been to Cornwall once and even I know that the characterisation of the locals is a bit over the top and it can devolve into accent jokes and stereotype jokes, but it doesn’t ever get particularly offensive, in fact the whole film feels as though it has been designed by the Cornish Tourist Board, helped by the fact that this is a very well shot film. The cinematography is actually genuinely pretty good, the editing could use a bit of work though as it kind of fails in a few parts although it is a genuinely well shot film. Need I say more, the soundtrack is excellent, as you would expect. The only problem I had with the soundtrack is something that was pointed out in Mark Commode’s review of the film, which I only checked out after seeing the film, where he pointed out something that I had noticed which is, if there are instruments that you can hear being played in the scenes, then somebody has to be playing those instruments! The whole film was also propped up by a stellar cast, including Daniel Mays, giving us a brilliant performance, Tuppence Middleton doing a very good job as Alwyn, the daughter of one of the fisherman, who Daniel Mays takes a liking to, another great British actor, James Purefoy who finally gets a film to sink his teeth into. Daniel Hayman, Christian Brassington and of course if you’ve seen I, Daniel Blake you will recognise Dave Johns from a mile off. What’s great about this cast is that they know what film they are in and they don’t try to overdo it, the fishermen themselves have excellent chemistry on screen, you can believe that they are from a tight knit community and everyone knows each other and genuinely cares for one another. This is also propped up by one of Noel Clarke’s hammiest performances to date, the man chews(?) the scenery of any scene he is in and it’s blooming excellent. His American accent is worth seeing the film for alone. Fisherman’s Friends is not, however, a perfect film, it falls down in quite a few areas. I have already mentioned the editing can be a bit weird on occasion and the fact that the film doesn’t exactly go against type. The film is also very jarringly paced; at times it can feel as though it is rushing its plot quite a bit trying to condense quite a lot of story in a short time period and Dear God, the third act really lost me, it rushes out the ending so fast it was unbelievable and it has one of the most forced conflicts I’ve seen in a long time and it gets resolved just as quickly, it’s kind of weird. Also, I didn’t really believe the love story as much as I think the film wanted me to. Daniel Mays and Tuppence Middleton do a good job trying to bring some chemistry to the characters, but the writing is where it falls down and it felt like the most fictionalised part of the film. The fact of the matter remains, however, as much as I can rip apart several factors now I know it’s not that great on a technical level, I still came out of the cinema with a bit of a smile. It is a genuinely enjoyable film and while the humour isn’t really there on occasions, it did make me laugh a couple of times. I liked the acting in the film, the cinematography was great and the use of the actual town the Fishermen were from was a stroke of genius. It just has a really strong soundtrack. The third act is where the film falls down for me and perhaps a further re-write might have ironed that out. I reckon it will be a nice film to watch at Christmas, but I think this film will have more success on television or DVD than at the cinema. However, if you really can’t be bothered to see it when it comes out on DVD and you’re still on the fence, then you’d still be well off going to the cinema to see it. It is pretty damn good. So that’s it from me for this week. Next week I’m going to be checking out the latest film from writer and director Jordan Peel, who brought us “Get Out”, with his new film “Us”. With all that being said, I hope you have enjoyed reading this as much as I have enjoyed writing it.